NEW YORK - In a deal that saved the tradition of high tea in the Palm Court — along with hundreds of jobs — the new owners of the landmark Plaza Hotel and its union reached an agreement that will keep some elegant interior spaces intact and reduce the number of rooms converted into luxury condos in an upcoming renovation. "The Plaza lives," declared Mike Naftali, chief executive officer of Elad Properties, while employees cheered, "The Plaza has been saved!" The agreement was finalized Thursday in a City Hall meeting involving Elad and the New York Hotel Trades Council. It still needs to be ratified by the union membership, but that appears to be a formality. Elad owner Yitzhak Tshuva and union president Peter Ward were greeted with wild applause when they raised their intertwined hands toward the gilded ceiling of the ballroom where Donald Trump once married Marla Maples. "We look forward to working for many years," said Ramon Richards, a Plaza banquet waiter since 1988. Since its 1907 opening, the 19-story Beaux Arts building has become an integral part of New York City and its lore. The Beatles stayed there in 1964 while in the city for "The Ed Sullivan Show," Trump used to own it, and author Kay Thompson's famous children's books on Eloise are set there. The agreement comes just two weeks before a $350 million renovation is scheduled to begin at the hotel overlooking Central Park. Elad paid $675 million for the Plaza last summer. Elad will still convert part of the building into 150 luxury condominiums, but 348 rooms will remain part of the hotel. Earlier plans called for turning the 805-room hotel into 200 condominiums and 150 hotel rooms. The union was guaranteed 350 jobs with a good chance that number could increase, and workers who wanted a buyout received two weeks severance for every year worked, Ward said. The Plaza currently has 900 union workers. Under the agreement, the hotel's famed public spaces — the ballroom, the Palm Court team room, the Oak Room and the adjoining Oak Bar — will remain "open for use to all New Yorkers and visitors to our city," Mayor Michael Bloomberg said. While the hotel's exterior was granted landmark status in 1969, its interior did not have that protection. Fears that the hotel would lose many of its famous spots prompted a "Save the Plaza" movement. More than 40 movies were filmed at the hotel, from Alfred Hitchcock's "North by Northwest" to "Home Alone 2." Ernest Hemingway once suggested that F. Scott Fitzgerald, a huge fan of the hotel, donate his liver to Princeton and his heart to the Plaza. And architect Frank Lloyd Wright, who made the hotel his Manhattan headquarters, offered the ultimate compliment: "I like it almost as if I built it myself." May 14, 2005 -- The new owner of the Plaza Hotel is seeking to sell all or a portion of his stake in the 300-room hotel to a luxury brand. Elad Properties, run by CEO Miki Naftali, already paid $600 million for the hotel and planned on spending another $300 million on renovations to it and the 150 condomiums he is creating. According to Real Estate Investment & Finance, Elad Naftali has reached out to Prince Alwaleed bin Talal, a partner in the Plaza's former ownership structure. Naftali told REFI he was also in discussions with Raffles Holdings, Shangri-La Hotels & Resorts, and Bvlgari Hotels & Resorts, among others. If a deal can be cut with the prince, it could bring Fairmont management back to the location. Fairmont has also been in discussions with the Essex House, but it is likely only one city hotel would fly its flag. Sources tell The Post Naftali hopes to sell either the entire hotel and some of the retail portion, or a non-controlling half stake in that entity to an investor or a luxury brand while he continues with the development of the condominiums. i was so upset when i found out that the plaza hotel is no more being that i have always wanted to go there and never having the money for it i will never get to see the inside of it. and for that i'm so upset there will never be a plaza hotel NEVER. Apparently you haven't read the recent updates. Bloomberg and the hotel unions lobbied for the planned conversion to be cut back so that more hotel rooms could be retained and that the famous spaces on the first floor of the hotel can remain open to the public. You'll just have to wait for them to reopen it. My girlfriend and i stayed at the Plaza last christmas and found it to be a truely magical experience. The barman told us at the time it was being made in Condos and he was losing his job, so i'm glad to read that some rooms/jobs will be saved. I hope to return to the plaza some day, but need to save up again! The new owner of the Plaza Hotel detailed its plans yesterday, for the first time, to redo the Plaza, including adding penthouse apartments on the unused roof and a large underground shopping space where kitchen equipment is now stored. The plans were immediately criticized by preservation groups. Elizabeth Ashby, president of the Historic Neighborhood Enhancement Alliance, said, "The Plaza is remembered as the Plaza Hotel, not as the Plaza Store or The Plaza Mall or the Plaza Condos." At a public hearing before the Landmarks Preservation Commission yesterday, Elad Properties, the new owner, revealed that in addition to a 350-room hotel and about 180 condominium apartments, it planned rooftop apartments and about 39,000 square feet of luxury stores underground. The hotel previously had 800 rooms. By comparison, Manhattan's largest supermarket, Whole Foods at the lower level of Time Warner Center, is 59,000 square feet. Elad must seek rulings from the landmarks commission before it can begin its $350 million renovation, which the company hopes to finish in late 2006, in time for the Plaza Hotel's 100th anniversary. Preservation groups and Elad are seeking the designation of eight interiors as landmarks, including the Oak Bar and Grand Ballroom. Elad is also seeking a "certificate of appropriateness" for work on the roof. The work includes revamping outdated heating and air-conditioning equipment and lowering the roof several inches, which could enhance the value of the terrace and other elements of penthouse apartments by allowing higher walls atop the roof. A 1991 commission ruling, still in force, permits the building of penthouse apartments. The most critical ruling Elad seeks from the commission is a "change of use" permit expanding the commercial use of the Plaza. The permit must also be approved by the city planning commission. Years ago, such permits allowing conversion of factory space to residential use helped establish SoHo lofts. The Plaza, however, is a special case. In a zoning quirk, part of the Plaza, including one side of the Grand Ballroom, is zoned residential, while the other part is zoned commercial. Elad argues that in order to preserve the interiors - operating the Oak Bar as a bar, for example - it needs the "change of use" permit to put most of the building into a commercial zone. The commission had expected to vote yesterday, but delayed consideration of all three Plaza hotel matters until July 12. At the hearing yesterday, John Oleske, a lawyer for Ronald S. Lauder, the philanthropist who opposes expanded retail use in the Plaza, urged the commission to take its time in reviewing Elad's plans. "Change the use," Mr. Oleske said, "and you destroy the landmark." Alex Herrera, an official with the New York Landmarks Conservancy, a private advocacy group, asked in his testimony where escalators, elevators and direction signs for shoppers would go. "After all," he said, "underground is not usually where the Fifth Avenue shopper normally goes." Miki Naftali, president and chief executive of Elad, said the company needed the rulings to restore the Plaza, not to change it. The rooftop permit, for example, is needed to bring order to the paint shop, air-conditioning equipment, bathroom vents and elevator shafts there, he said. "It looks like a jungle," Mr. Naftali said. As for unsightly escalators and other potential problems, he said, "if we ask for more vertical transportation, we will come back in front of the public, and ask for it, and we'll talk about it then." Questioned after the hearing whether he was trying to pull a fast one by transforming a historic hotel into a shopping center, as his critics were implying, Mr. Naftali replied: "I'm not trying to do it, I don't want to do it and I cannot do it. It is not my style." 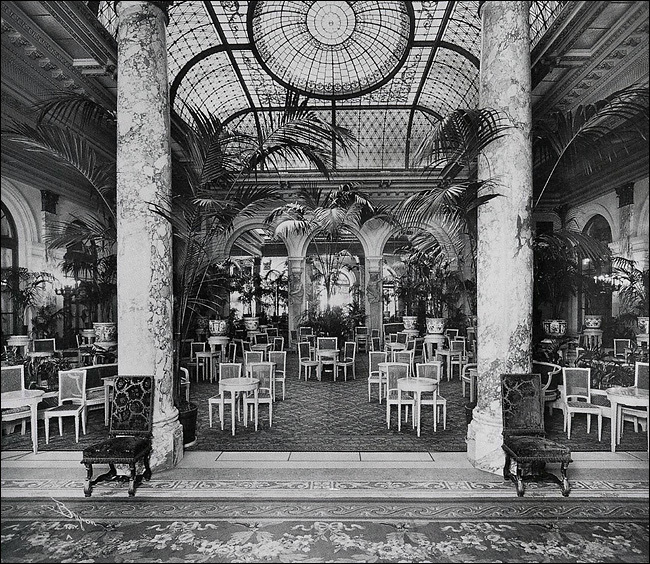 The Palm Court of the Plaza, before its glass ceiling was removed. Renovations at the Plaza Hotel will restore it to its original grandeur, city landmarks officials said yesterday after they cleared the way for vast changes, including converting hotel rooms to condominiums and adding an underground complex of luxury stores. The Landmarks Preservation Commission recommended the approval of a landmarks waiver that would allow for 39,000 square feet of commercial space. It gave permission to make changes to the exterior of the building - which already had landmark status - including adding a new entrance for the stores. The commission also bestowed landmark status on eight of the hotel's famous public rooms and adjacent corridors and vestibules, including murals, chandeliers and decorative metalwork. The rooms include the Palm Court, the setting for a scene from the movie "The Great Gatsby;" the Terrace Room, where Marilyn Monroe's dress strap once slipped off her shoulder while she was being interviewed by reporters; and the Oak Bar, where Cary Grant's character was kidnapped in "North by Northwest." Before the decision, the owner, Elad Properties, announced a plan to recreate a 1907 domed glass ceiling in the Palm Court, a move that the landmarks commissioners suggested at a hearing several weeks ago. Even so, a preservation group said the changes would destroy the character of one of the grandest grand hotels in the city, and pledged to fight the next step of the approval process, at the City Planning Commission. "It isn't a part-store, part-hotel, part-condo - it's a hotel," said Elizabeth Ashby, president of the Historic Neighborhood Enhancement Alliance. "It is the Plaza, known worldwide for what it is." And the businessman Ronald S. Lauder, who has lobbied to restrict the Plaza to hotel use and went so far as to fly to Israel to negotiate with Elad executives, said in a statement that he would continue his efforts to save the Plaza "from being transformed into another gaudy bazaar." Eight members of the commission voted to recommend allowing more commercial use, and one abstained. The commissioner who abstained, Roberta Brandes Gratz, said that none of the developer's proposals had shown any concern for preservation until the glass ceiling in the Palm Court was proposed. Walter B. Melvin, an architect for Elad, said he had spent the past two weeks planning a recreation of the original Palm Court "laylight," the glass ceiling with patterned lead canes that once formed the decorative interior of a 40-foot skylight. A 1921 addition to the hotel blocked the natural light, and the skylight itself was removed around World War II, according to Elad representatives, to prevent it from being a beacon during air raids. The new plan calls for artificial lights above the glass ceiling to create the impression of sunlight. "The laylight was a crucial factor," said Robert B. Tierney, the chairman of the commission. "What triggered that was our assessment that the preservation plan was significant," he said, adding that the plans would return the hotel to its 1920's sumptuousness. Yesterday's decisions marked the latest chapter in a contentious process. Elad Properties had originally planned to convert the entire building to stores and apartments, but last winter, Mayor Michael R. Bloomberg helped broker a compromise that would keep nearly half the hotel rooms and preserve the jobs of about 350 of the Plaza's 900 workers. The renovation will turn the 800-room hotel into a 350-room one with 180 condominiums, apartments and shopping space. The renovation is expected to cost more than $350 million, and Elad hopes to finish it by late 2006, in time for the Plaza's 100th anniversary. "For me personally this is a once in a lifetime opportunity to do something unique," said Miki Naftali, the president and chief executive of Elad. Fairmont Hotels & Resorts Inc., has entered an agreement to manage the Plaza Hotel, which is currently undergoing a $350 million renovation and is presently closed. When it reopens, which is now expected in early 2007, it will have 182 condominium apartments and 282 hotel units/keys. Of the 282 hotel units/keys, 152 can be sold as "hotel-condos," in which purchasers will own part of the condominium entity and have the right to stay for up to four months a year in one of the units, all of which will be sold fully furnished. Under the terms of the agreement, according to Shannon Lynch, a spokesperson for Elad Properties, which brought the hotel for about $675 million last year, Fairmont will manage both the hotel units and the condominium apartments. Ms. Lynch said told CityRealty.com today that her company, Linden, Alschuler & Kaplan, has "received no information" that Prince Alaweed bin Talal of Saudi Arabia may be negotiating to buy back into the hotel in which he was a partner in the former ownership structure. The prince reportedly does has a relationship with Fairmont. Fairmont announced that it was entered the agreement with Elad November 22. The Plaza Hotel is one of the major landmarks of New York City and there was considerable controversy when it was acquired by Elad that too much of the hotel would be converted to apartments. Elad subsequently reduced the number of condominium units in its plan. There was some confusion about how many hotel rooms it will have. Some reports mentioned a number higher than 282, but there were referring to labor union room counts as opposed to the number of hotel "keys," and as there are numerous suites the correct number, Ms. Lynch said, is 282. The “Private Residences” at The Plaza Hotel will have their own entrance on Central Park South and a large garden court, shown at the right, with cascading fountain at the bottom of the building’s large rectangular lightwell. Apartments will range from about $2 million for a one-bedroom unit facing the courtyard to about $40 million for a high floor unit facing Central Park. A three-bedroom plus library unit with 3,068 square feet on the sixth floor at the southeast turret corner at 48th Street facing Fifth Avenue is priced at about $8,600,000. A two-bedroom unit with 2,348 square feet on the 13th floor is priced at $7 million. A large billboard was erected today at the northeast corner of the building announcing the availability of the “residences.” There will be a total of 181 apartments, all on the north and east sides of the building and the hotel rooms will be on the south side along 58th Street. Not all of the apartments are available now. Units on the 4th, 7th, 8th, 10th, 11th, 12th, 14th, 15th, 16th, 18th and 19th floors will be “released” at a later date. The Plaza Hotel was designed by Henry J. Hardenbergh, the architect who designed the Dakota apartment building at 1 West 72nd Street, and opened in 1907. In 1921, Warren & Wetmore designed an expansion on 58th Street. The hotel’s exterior was designated a city landmark in the 1960s and eight of its public rooms were declared interior landmarks last July. Elad Properties, which bought the Plaza last year for $675 million, received approval from the New York State Attorney General’s office for the condominium apartments, which are being offered for a total of $1,331,000,000. Elad is restoring many of the building’s spectacular interiors including the Palm Court where it will replace the ceiling with a leaded-glass lay light to recall the original. The building is now surrounded by handsome steel structural supports for scaffolding. Many of the smaller hotel rooms are being enlarged for the apartments and will have mosaic stone floors by Sicis. Kitchens will have Nero Marquina stone counters and Callacata marble tile backsplashes. Original features such as chandeliers, ornate mantelpices and decorative moldings will be preserved and restored where practical. I'm writing everyone that could be remotely concerned with what has happened at the Plaza Hotel. I felt some sense of relief when the worthless Landmarks Commission finally realized that the Plaza was a treasured landmark that belongs to the people of New York. I have recently heard heartbreaking accounts from people who have first hand knowledge of what went on the last days the Plaza closed and was ransacked during the public sale. Those rotten bastards at Elad sold everything, lock stock and barrel down to the double P brass door knobs and door plates. In the "Land marked" areas, they used unskilled, pissed off union workers to "pack up". Chandeliers were packed like garbage, the irreplaceable smoked glass mirrors in the Palm Court were broken, everything was done to spare spending any money that was necessary. When it re-opens, it's going to look like a cheap Trump building. This is a tragedy right up there with losing Penn Station. Elad must some how be held accountable. If not legally and financially, they should at least feel the wrath and outrage of New Yorker's like myself who have fond memories of the Plaza. Feel free to post this appeal or forward to anyone who might be remotely concerned or interested. Heaven help us if this is true. Actually I wrote the letter that he posted and it is 100% true. The public spaces were landmarked but that Vile Miki Naftali of Elad Properties only sees $ signs. They could care less about the history or sentiment that the Plaza envokes. Every thing was done to save the most $$$. The "Landmark" status was a joke....there is no enforcement by the worthless Landmarks Commission. And now Elad has the New York Times doing a PR campaign for them just in time for the condo sales office to open. They know that by the time that it re-opens in 2008 they will have sold all the condo's and will be laughing all the way to the bank as the public is outraged at the mess they made. In contrastl, I stopped in the new Balducci's on 14th and 8th, in a Landmarked Bank building. The minute you step in the door you realize that it was restored to it's soaring glory by people who cared and sparred no expense. I saw a show on NYC TV cable - Grand Tour: New York, New York. Anyone? It's basically about the Plaza and the Waldorf-Astoria, and the oppulent structures they were when built. It showed the incredible craftsmanship of these two hotels including some rooms, architecture, and artwork I had never seen - true treasures from the American guilded age. It pains me to hear it was ransacked and the mirrors broken in the Palm Court. The chandeliers belong in a museum, not the garbage. After talking about the "genius idea" of mosaic tile floors in the bathrooms and the look of marble countertops in the kitchen and the quarter-sawn wood that will go into the herringbone floors in the dining room, Alexa Lambert mentioned the price of the apartment: $9.45 million. "Or," she said, "to be exact, $9,455,625." The near-eight-figure price was not for an apartment in a prewar building on Park Avenue or Fifth Avenue or Central Park West where Ms. Lambert has made a career of brokering big-money sales. This apartment was in the Plaza Hotel. Well, that is where the apartment will be. Ms. Lambert, a senior vice president of Stribling & Associates, the real estate brokerage firm that is marketing the Plaza redevelopment, could not lead the way on a walk-through because so far, apartment 803 does not exist. So she turned to a 21st-century sales tool: a computerized system that shows floor plans on a wide-screen television. She touched a smaller screen, and views from the future apartment appeared. A photographer had snapped pictures from each window in the 99-year-old building, on a sunny day after the Plaza closed in April. Something else was different about this sales pitch. Ms. Lambert was describing the apartment not to a customer, but to a reporter. The owners would not let a reporter tag along with a potential customer. But they agreed to let Ms. Lambert make the same presentation she would make to someone who could afford the 10 percent down payment. Not to mention the other 90 percent. For most customers, a visit to the Plaza begins with a greeting from Edwin Trinka, a doorman at the Plaza for 42 years who was rehired by the condominium developer. He remembers when the Beatles were inside, as guests, and crowds were outside, screaming. He remembers shaking hands with Tony Randall and Johnny Cash. He remembers when Ed Sullivan would stop in to buy a newspaper-and buy one for Mr. Trinka, too. Ms. Lambert, emerging from what was the Edwardian Room and is now the sales office, talked about the lobby, on Central Park South. "Secure and private," she said. "Only the residents enter that way." In other words, guests in the 282-room hotel that will occupy the other side of the building will enter from a different entrance, facing Fifth Avenue. Ms. Lambert said that the Plaza appealed to "people with lots of staff." People who move from large prewar apartments "won't have to manage a staff" at the Plaza because the hotel part of the Plaza can pitch in. For a price, of course. So how much will a maid cost? "For most people, that's not the question," she said. "The question is, can I get it?" In the sales office, she showed off a small, wireless touch-screen that she said would be in each apartment. "Mr. & Mrs. Private Plaza Residence Owner," the screen said. "You can send for your car" using the device, she said, and see when it pulls up in front of the building. "Or," she said, "you can make a reservation for dinner." The screen offered a choice of Jean Georges, Daniel, Le Bernardin, Per Se and Aureole. She tapped the screen and reserved a table for March 18, at Aureole. It is not a real reservation, she said. The system has yet to be connected to the restaurants. But back to Ms. Lambert's sales pitch. Maybe Apartment 803 was not enough - not big enough, at just under 2,000 square feet, or not exciting enough. Ms. Lambert had a suggestion: Do what three potential buyers are considering doing - combine Apartments 807 and 809, the apartment at a corner of the building. Of course Apartment 807, at 2,248 square feet, is more expensive than Apartment 803 - $1,306,875 more expensive. And then there is Apartment 809 - another 2,820 square feet, and another $13,837,500. Or, for something even larger, there is Apartment 2001, a 5,613-square-foot triplex for $29.5 million. "We worked really hard on the floor plans to make them make sense," she said. "We've walked through 740 Park, 720 Park, 720 Fifth. That's our frame of reference. We wanted to be like that. These are not flawed. You won't say, 'Here's the problem.' "
She also mentioned the George V, the ultra-luxury hotel in Paris. "Architects would sit around and we'd refer a lot to the George V. I didn't tell them I've never actually stayed in the George V."
Her presentation finished, Ms. Lambert handed over a $39.95 book, "At the Plaza: An Illustrated History of the World's Most Famous Hotel" by Curtis Gathje (St. Martin's) and a document case. She does not say anything as crass as "hurry-they're going fast" or that she would like to put a sales contract in the document case. But since she made her pitch, the week before Christmas, Apartment 803 has been sold. Still, she said, there are others.